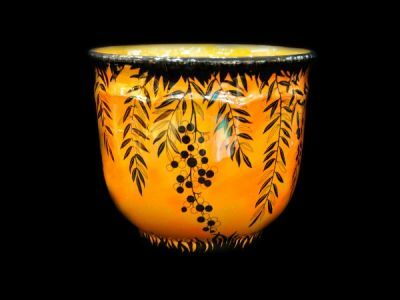 Art Deco piece with phenomenal Orange Lustre glaze, which has an almost pearlescent quality. Black Brazilian red pepper tree decoration. This piece is from c.1930. The bottom is marked “Trade Mark Crown Ducal Ware A.G.R. & Co. Ltd. England.” It sits 20 cm high.